Questions or concerns about USGS streamflow data in Wyoming and Montana can be directed to Kirk Miller (kmiller@usgs.gov; 307-775-9168). USGS monitoring activities at these sites are funded by partner agencies and with USGS Groundwater and Streamflow Information Program Cooperative Matching Funds. Lack of partner funding for these sites results in discontinuation of all streamgaging activities. 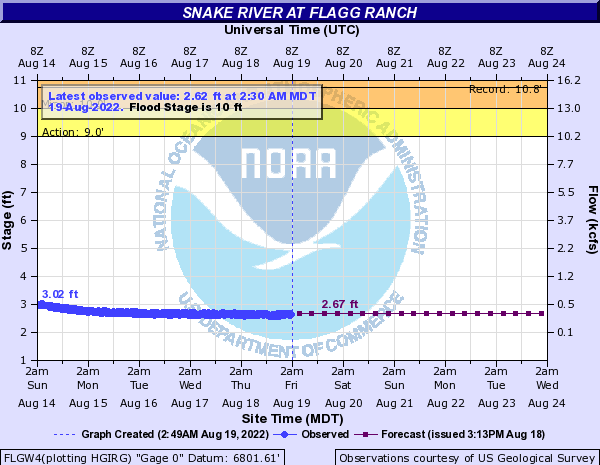 Questions or concerns can be directed to Kirk Miller (kmiller@usgs.gov; 307-775-9168). Station operated in cooperation with Idaho Water District No. 1.